A range of diving gas conditioners is available for removing carbon dioxide from various environments, as well as conditioners to remove order within chambers. A range of low-dusting sodalimes is produced that are highly efficient in removing carbon dioxide when used in chamber/bell scrubbers and gas conditioning units. The speciality '797' grade has high performance characteristics required in critical applications like diver bail-out systems and self-contained oxygen breathing apparatus. 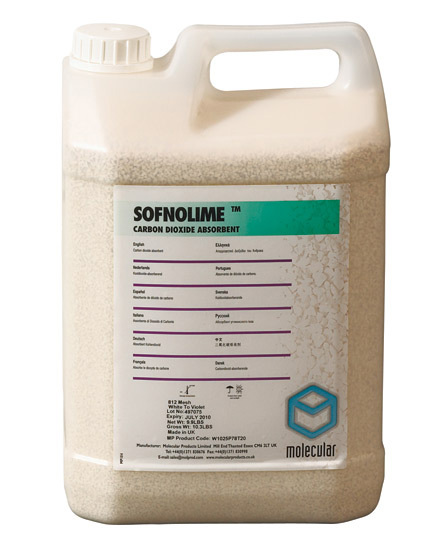 Sofnolime is available with an indicator, incorporated during manufacture, which changes the sodalime colour from white to violet upon exhaustion. This is a useful safety feature and is used by the majority of diving operators. Normally supplied in 20kg containers, but 1kg or 50kg units are also available. The sofnolime 408 is the general grade used and sofnolime 1550 is specially designed for use in tourist submarines. This is a simple and efficient catalyst for removing CO from welding habitats and other environments. Based on the precious metals platinum and palladium it operates at ambient temperatures having a high tolerance to deactivation by water. This is a fine grade charcoal used in the removal of odour in chamber gas conditioning units and compressors. A potassium permanganate impregnated alumina. It is used to remove unpleasant odours from the living habitat and operates by a combination absorption and oxidation.